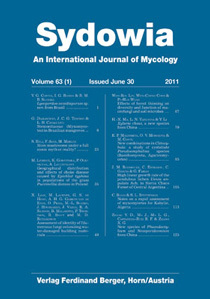 Malysheva E. F., Morozova O. V. & Contu M. (2011) New combinations in Clitocybula: a study of cystidiate Pseudoomphalina species (Basidiomycota, Agaricomycetes). The morphology and phylogeny inferred using molecular data from the nrITS region of species traditionally classified in the genus Pseudoomphalina (Basidiomycota, Agaricomycetes) are investigated. The present work is mainly focused on two cystidiate species, viz. Pseudoomphalina flavoaurantia and P. lignicola, which were originally described from Italy and Russia, respectively. Morphological examination of type collections and phylogenetic analyses showed these species to be closely related to each other and sister to a representative clade of Clitocybula species in a larger clade that is recognized as Clitocybula. A neotype for Pseudoomphalina lignicola is designated and the new combinations, Clitocybula flavoaurantia and Clitocybula lignicola are proposed.